It is the dawn of another winter season in India and like always Indians look forward to witness snowfall. Well who won't be interested in snowfall? After all it is not so common in India. For people living in cities a get away to a hill station is the perfect winter vacation plan. Even for the children watching snowfall is an equally amusing thing. 1. 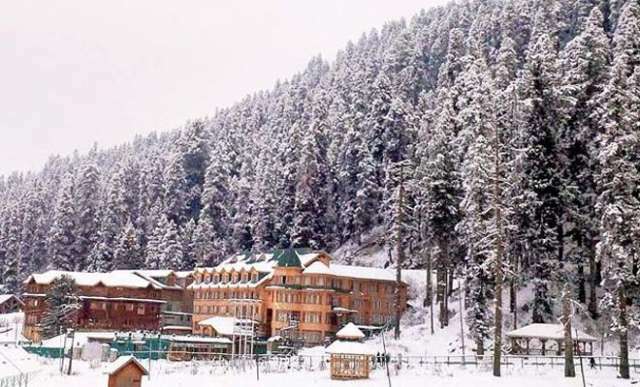 Gulmarg (Kashmir): The paradise on Earth Kashmir barely has a summer season. Gulmarg is a popular skeeing destination and an iconic tourist destination in Kashmir. The snow covered pines and the exotic experience of skeeing is worth cherishing for a lifetime. 2. Shimla: The capital of Himachal Pradesh Shimla is a popular winter destination in India. The months of December and January witness heavy snowfall in Shimla hence attracting tourists in large number. 3. Manali: Featured in many Bollywood movies Manali is one of the most favoured hill stations in India. Greenary beautiful snowfall clear streams add to the beauty of Manali. During Christmas and New Year many local and foreign visitors visit here. 4. Tawang: This Northeast hill station is one of the least explored places in India. Located in a remote area of Arunachal Pradesh Tawang is one of those places which get snowfall throughout the year. Known for the beautiful Buddhist monasteries Tawang's beauty is still untouched and a treat to the eyes. 5. Pahalgam: Another wonder in Kashmir Pahalgam is the starting point of Amarnath Yatra. The famous tourist attraction includes snow covered peaks and frozen lakes. The environment is Pahalgam is clean and well maintained for tourists.